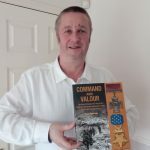 To celebrate the launch of Stuart Robertson’s new book ‘Command & Valour’ we’re giving you the chance to get to know Stuart a little better and giving you the opportunity to get a signed copy. Every day for the next 10 days we will be putting up a short clip of Stuart talking about ‘Command & Valour’ and when they are all uploaded we will select one of our subscribers at random to receive a free signed copy. 01 – What gave you an interest in History and Normandy? 02 – What is different about the tours you give in Normandy? 03 – What sort of people visit Normandy? 04 – What can you tell us about some of the less well known sites in Normandy? 05 – Stuart talks about his first book “D-Day – Following in the Footsteps of Heroes”. 06 – What is so unique about your new book “Command and Valour” ? 07 – With so many tremendous acts of bravery how was someone awarded a medal? 08 – Did any particular act of bravery stand out to you personally? 09 – Did the race of soldiers effect medal awards? 10 – How have historians and Hollywood distorted our view of D-Day and the Normandy Campaign? 11- Is the criticism of Montgomery justified?